She was a fireball and a prodigy. He was a genius. Their art was revolutionary. Sparks flew between and around them...She burnt out much too soon. At the turn of the nineteenth century, seventeen year-old Camille Claudel dreams of becoming a famous sculptor, but becoming a female artist means pushing the boundaries of convention a little too far. In Paris Camille will be able to attend art school and possibly have an atelier of her own. Thus, the Claudel family relocates in search of better opportunities for their two most talented offsprings. Camille soon overshadows her classmates in art school, and her private tutor, a renowned sculptor, sees greatness in her. 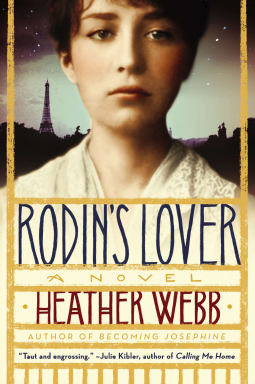 When he wins a prestigious prize and must leave Paris for Rome, he convinces his friend Auguste Rodin to nurture Camille's talent. But what's with this fiery young beauty who manages to make Rodin feel so uncertain yet capable of tackling anything?! Rodin's Lover reverberates with intensity. I could picture the unfolding story in my mind as if I were watching a movie. I have read passages of a book on Mendeleev's quest to organize the chemical elements into a reasonable system. The book is after my own heart, but I have never been able to finish it because I become overwhelmed by emotion to the point that I feel I am on fire, blood pumping in my ears, and bells tolling in my chest. That was the effect Rodin's Lover had on me. I felt uncomfortably aglow, feeling intensely the chemistry between Rodin and Camille--not only the measure of their desire for each other but their intellectual compatibility as well. Heather Webb has managed quite a feat: to penetrate the mind of a genius, shed light on the chaos that sometimes reigns inside, and expose his creative process. Rodin has come alive in all his glory and complexity: his desires, his dreams, his energy and all-consuming passion...And so has Camille. Webb has zeroed in on how it must have felt as a talented woman to work in a field dominated by men and be overshadowed by them. It is an issue as timely in this day and age as it was at the end of the nineteenth century. It is said that the line that divides genius and madness is a fine one; Webb has masterfully made it blurry. In Camille there is virtually no difference between a driven individual and an obsessed one. DISCLAIMER: I received from the publisher a free egalley of this book via NetGalley in exchange for an honest review. I love the new look of your blog! And within a week you have answered my question about who were and are the female geniuses. I will be reading this book! Thank you, Judy! I think it was time for a makeover. Camille Claudel was a prodigy but very tormented as well. I'll make sure I read your review if you decide to read it. I had missed this post when you first published it - glad I found it today. The book sounds fascinating and I do love historical fiction. Another one for my TBR list! Dorothy, this one is lovely; I loved it!